I know it's been kinda slow in coming along, this personal elders documentation project I've planned about two years ago. Can't blame some people, mostly posters in FB, for suggesting I just come to their place and take shots. I appreciate the welcome but building trust, especially among the village elders is not built overnight. Nor is it built on the strength of two or three visits (case in point: I've been visiting every 2-3 months the past 4 1/2 years). I deviated from Maligcong a bit by heading to Alab Oriente on the hope of finding Apo Herbert Todyog, probably the oldest living citizen of Bontoc, but I aim to continue my Maligcong advocacy. I can't really blame some of the locals for refusing to pose for the camera. The plain truth can be painful to admit -- they've been burned by one too many camera-wielding tourists/visitors/photographers either stealing a shot or two, or brazenly taking a picture and maybe promising to give a print copy but NEVER did. There have been cases of requests from the family of an elder who passed on for a picture to remember their loved one by but were either openly refused or tacitly ignored. It's a sad thing really. And one that bears a burden to future interactions with photographers who mean well. 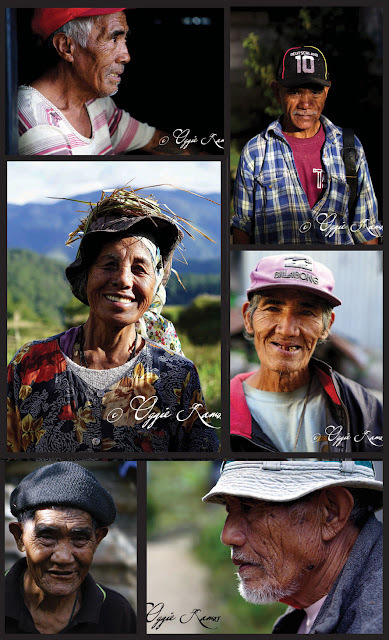 Anyway, on this January 2019 visit, I added six faces to the Maligcong Elders gallery; some we really have to coax to oblige for a picture or two. There were colorful people my guide on this occasion, Gina Ati-oan, and I, have to respect for their vehement refusal to pose. Still, a bright point to our visit to Fangurao was bumping into one of my female subjects last November. I remembered that she really didn't want to pose for a picture when my friend, Suzette, and I, bumped into her coming home from working in the fields. When I handed her prints of her picture, she let out a loud laugh, exclaiming that she's old and wrinkled. I guess bringing some joy to the elders is worth the time and effort. Maybe word will get around that some crazy regular visitor to their place go around taking pictures of their peers and for a change, comes back and hand them a copy -- to smile, to laugh, maybe even to fuss about.